6PLUS1® Multilevel Plasma Calibrator Set, lyophilised. These Chromsystems plasma calibrators are designed for calibrating your analysis system. 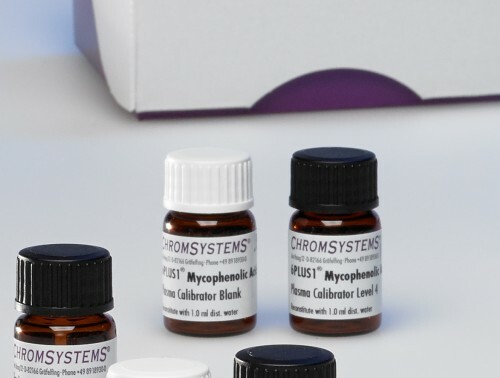 The lyophilised calibrators are based on human plasma and are analysed routinely in the same manner as a patient specimen. They are available as Multilevel Calibrator Set only, with 6 different calibration levels and blank. Blank Calibrator Mycophenolic acid LC-MS/MS mg/l n.d. n.d.
Mycophenolic acid glucuronide LC-MS/MS mg/l n.d. n.d. Remove the rubber stopper from the vial. Add exactly 1.0 ml distilled water into the vial. Replace the stopper and allow to sit for 10 to 15 minutes at room temperature. Swirl the vial to dissolve the contents until homogeneity. Stored below –18 °C unopened calibrators are stable until the expiry date which is stated on the vial labels. The reconstituted plasma calibrators when kept light protected, tightly closed and cool (+2 to +8 °C) are stable for at least four weeks. For longer periods, store frozen below –18 °C, the lifetime is then at least three months. After thawing, mix thoroughly.